Anti-government demonstrators have reportedly attacked police stations in Iran, prompting Tehran to intensify its efforts against people participating in rallies that have been raging since last week. So far, confrontations between Iranian security forces and protesters have killed up to 21 people in what has been described as one of the most audacious challenges to Iran’s strict Islamic authority since unrest shook the Shiite powerhouse in 2009. Authorities have also arrested more than 450 demonstrators in the Iranian capital, Tehran, alone. 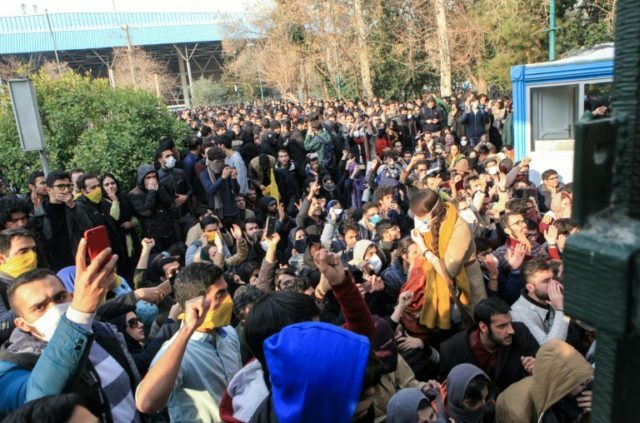 The semi-official Iranian Labour News Agency (ILNA) reportedly learned from Ali Asghar Naserbakht, the deputy governor of Tehran province, that law enforcement detained about 200 people on Saturday, 150 people on Sunday, and an estimated 100 people on Monday. “Hundreds of others have been arrested in other cities, according to agency reports and social media,” notes Reuters. Anti-government protesters have been chanting slogans against the clerical leadership that has been in power in Iran since the 1979 revolution, including Supreme Leader Ayatollah Ali Khamenei, the top authority in the Islamic Republic’s system of dual clerical and republican rule. Demonstrators have also directed their anger towards Iranian President Hassan Rouhani. Nevertheless, “Rouhani refrained on Monday from accepting the responsibility of problems raised by protesters, and he blamed his predecessor and also Iran’s long-time adversary, the United States for the government’s shortcomings,” Reuters points out. Echoing Rouhani, Ayatollah Khamenei blamed Iran’s woes on “enemies” of the Islamic Republic. “The enemies have united and are using all their means, money, weapons, policies and security services to create problems for the Islamic regime,” declared Khamenei in a speech aired on state television. Meanwhile, Iran’s elite Revolutionary Guards claimed they had not been requested to intervene directly. Sarita Mohammadi, a 35-year-old teacher in Tehran, indicated to the Agence France-Presse (AFP) news agency that Iranians are tired of the status-quo. “People have had enough, especially the young people. They have nothing to be happy about,” proclaimed Mohammadi. “The situation is far worse in provinces. Agriculture has been destroyed. I know many who have left the north of the country to come to Tehran to work,” the teacher added.